Mountain Hardwear Sarafin Cardigan - Women's: Mountain Hardwear constructed this cardigan with eco friendly reclaimed wool and then added a polyester and nylon twist for durability. The Sarafin Cardigan features raglan sleeves and a slim fit for a body-hugging, flattering shape. Constructed of 40% reclaimed wool, 40% polyester, 18% nylon, 2% other Dihedral Birdseye Jersey fabric. FEATURES of the Mountain Hardwear Women's Sarafin Cardigan. SPECIFICATIONS of the Mountain Hardwear Women's Sarafin Cardigan. The soft and cozy wool-blend Mountain Hardwear Women's Sarafin Cardigan feels everyday comfy and has oodles of versatile style. This midweight cardigan has stretch and warmth plus ribbed sleeves and panels for added mobility. A chin guard and flatlock seams eliminate chafing for top-to-bottom comfort. 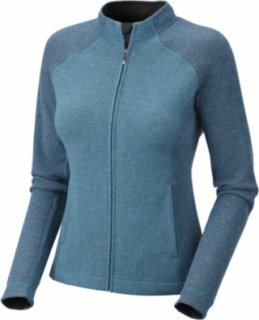 On its own or layered under your favorite shell, the Mountain Hardwear Women's Sarafin Cardigan Sweater is a stylish, semi-fitted sweater perfect for hiking, climbing, and everyday wear. The rugged wool-like exterior is naturally moisture wicking and provides amazing insulation, with a supple soft inside for no-itch comfort. Full rib sleeves and a slim fit give a flattering, body-hugging shape. It's thanks to the ribbed fabric on the sides and arms that Mountain Hardwear's Sarafin cardigan sweater is so flattering, and it's thanks to the warm, durable fabric blend (including recycled wool) that this sweater is so very warm. Constructed of eco-friendly reclaimed wool, with polyester and nylon added for durability, the Sarafin Cardigan from Mountain Hardwear is an ideal piece for layering on as the temperatures drop. On chilly winter evenings, you're sure to appreciate the warm Dihedral Birdseye jersey fabric of the Mountain Hardwear Sarafin Cardigan, but it's the full rib sleeves and stylish design that will catch the eyes of passersby. We start with eco-friendly reclaimed wool and add polyester and nylon for durability. Raglan sleeves and a slim fit give a flattering, body-hugging shape. 12 people have already set their own price.